I just discovered a cool, new container for packing lunches from LunchBots. I'm admittedly a bit obsessed with safe and convenient lunch packing systems. I try to avoid plastics and disposable wrappers. Another mom found it hard to find suitable packing containers that met her strict standards, so she decided to start her own company. LunchBots are made from food grade stainless steel (even the lids). I haven't had a chance to try them myself, but they seem like very convenient shapes and sizes. The design is simple, yet appealing. I personally have had good luck with the stainless containers that I found at Daiso, though I always wonder if the quality of the metal is safe. Plus, those pieces come with plastic lids, which are slowly but surely starting to crack and break, despite my gentle hand washing. 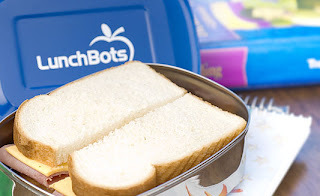 LunchBots is definitely on my list of containers to try if I should need to replace any of ours. I like that their website offers an opportunity to have a school fundraiser by placing a group order for the products. That's an awesome idea! I try to be as environmentally friendly as i can, and these containers are a great alternative.